We know the Earth is flat, and that the heavenly bodies are much much closer(and smaller), and that there may be a dome above us, but that's about it. Current flat Earthers have few particulars and are still pretty much in the dark as to the actual shape, size and form of our physical home or universe. The Vedas, the oldest scriptures on Earth, on the other hand, seem to have many specific details about the dimensions of our Earth and Universe. In the first two diagrams below, the order and vastness of the different components of our physical reality are laid out. They can be found in the Srimad-Bhagvatam texts. The figures given in the diagrams are measured in yojanas. One yojana is presumably 8 miles in length. 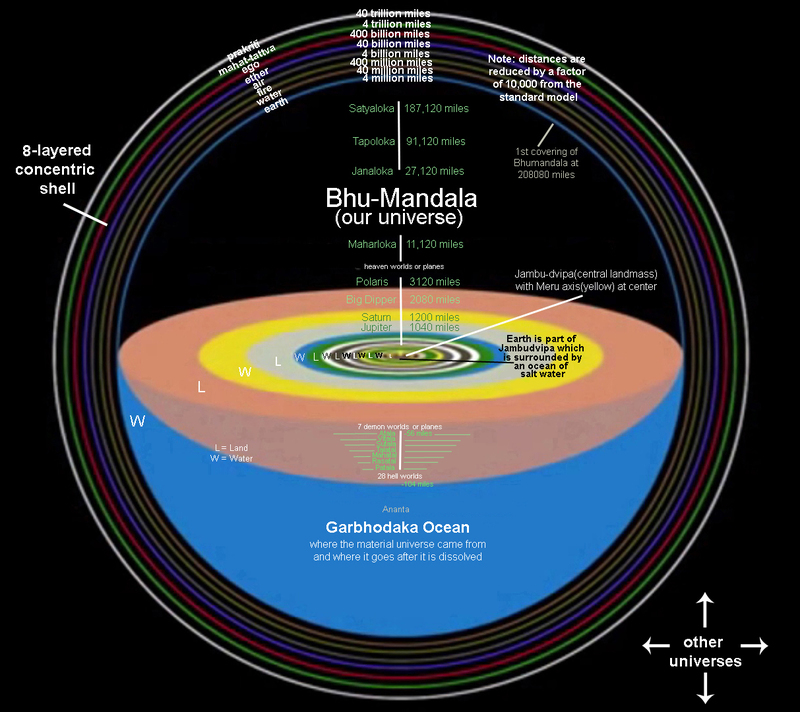 If this is correct it makes the bhu-mandala plane some 4 billion miles in diameter! That is huge! Jambudvipa or the central part of this plane where our Earth is located is 100,000 yojanas or 800,000 miles wide! 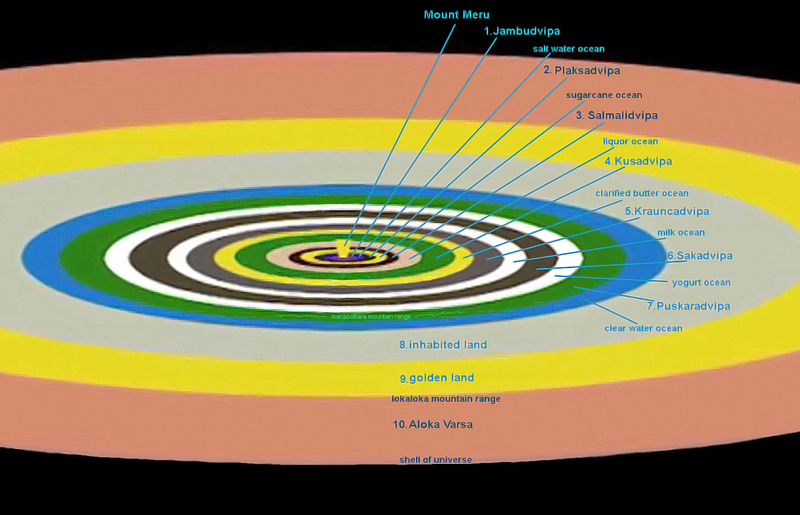 Jambudvipa is then divided into 9 varsas of 72,000 miles, each of which contains 9 "Earths?" of 8,800 miles. Our Earth is in the southernmost part of Bharata-varsa. But are these figures accurate? What really puzzles me is that that Bhu-mandala, Jambudvipa and Bharata are all interchangeably used to describe Earth, so the figures given in the diagrams may be misleading. The kicker was when the Moon was said to be at almost 240,000 miles from the Earth, which every flat Earther knows is wrong. Obviously the sizes and distances have been influenced by modern astronomy and are not to be trusted. This does not mean that the lands beyond our current conception of Earth do not exist or that they are obviously larger. If Earth is part of Jambudvipa or all of it is not certain, but beyond our salt water ocean to the south, are very possibly at least 7 other ringlets of land much larger, each separated by a ringlet of water as the 2nd image depicts. Antarctica may be a buffer or the beginning of Plaksadvipa. The oceans themselves are extremely interesting as they are described, but more so are the other land rings and who or what they contain. Even the sizes of these outer land rings is are dispute. Most sources say that each successive ring is twice as large as the previous one while others say ten times. There is obviously a lot of confusion or even disinformation here. I guess we'll never really know for sure until the the powers that be are no longer in power and we are free to explore the answers for ourselves. According to the Srimad-Bhagavatam, only Bharata-varsa where Earth is in Jambudvipa(1), is inhabited by inferior humans. All of the 8 other varsas of Jambudvipa have humans or demigods living lives there much superior to our own. Jambudvipa is surrounded by an ocean of salt water. Plaksadvipa(2) or the first land ring beyond Jambudvipa, is described as being inhabited by four castes of people, all living to one thousand years. They are beautiful demi-gods who worship Lord Vishnu the Sun god. Plaksadvipa is divided into seven sections or varsas, each of which contains seven holy mountains and rivers. In one of these varsas is the golden Plaksa tree. It is hotter here, fig trees are common, and the land is surrounded by a sugarcane juice ocean. Salmalidvipa(3) is also divided into seven parts each with seven holy mountains and rivers. Salmalidvipa derives its name from the Salmali tree which grows there which is 100 yojanas wide and 1100 yojanas tall, and is the residence of Garuda -king of all the birds. The inhabitants worship the Moon/God Candratma(Chandra) and they grow and harvest grain for the demigods. Salmalidvipa is rich in rare minerals, fauna, and animals and is surrounded by an ocean of liquor. Kusadvipa's(4) inhabitants worship Agni the fire god, and that the land is named after the fiery Kusa grass that grows there. It is very hot here(it is closer to the orbit of the Sun) and the land looks reddish from afar. It is surrounded by an ocean of liquid ghee. This land is not suitable for living for the inhabitants of Jambudvipa. Krauncadvipa(5) takes its name from Kraunca the great mountain there that is full of gems. Krauncadvipa, like all the others, is divided into seven sections each containing seven great mountains and rivers, and the inhabitants there worship Vayu or Varunadeva the god of water. Krauncadvipa is very close to the Sun and has a misty or watery atmosphere which the Sun god uses for fuel. Sakadvipa(6) is named after the fragrant oak trees there. The inhabitants of Shakadvipa worship Vayu the demi-god of air. The land is surrounded by an ocean of churned yogurt. Not much else is known about it. Puskaradvipa(7) is divided in two by the Manasottara montains and the inhabitants worship Svayambhu. The petals of the Universe's lotus start here. 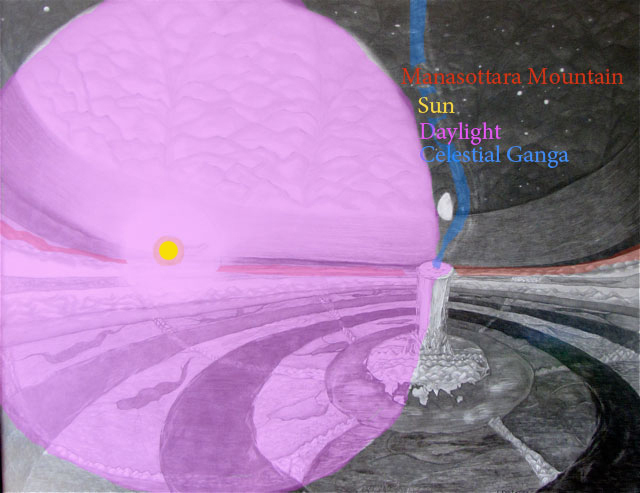 The demi-god of the Sun travels atop the Manasottara mountain range producing day for all of Bhumandala when it is above, and producing night when it sinks below to the side of the range. Little if anything is known of the other lands beyond Puskaradvipa. In the inhabited land(8) are entities that are not of a high order, and the golden land(9) is an uninhabited area where the sun's light is collected and distributed to where it is needed throughout the universe. The Loka-loka mountains are as high as the universe itself in the form of petals and divide the lit surface world from the dark side. Beyond the Loka-loka mountains is Aloka-varsa(10) the land of the pure, where those who wish to liberate themselves from the material universe go. Krishna came here with Arjuna to bring back the sons of the brahmana. Finally, we reach the shell of our egg universe, and beyond that is the cosmic sea containing other universes or Bhumandalas. This ends the lateral or horizontal description of Bhumandala. There is also an upwards and downwards or vertical description which is highlighted by the height of the heavenly spheres or bodies and the hellish worlds as shown in the next diagram below. Bhumandala is often described as a solar system and its flat plane as an ecliptic and its land rings as the paths of the planets. This may be true to some extent. There is also reason to believe that central Meru not only holds/creates the zodiacal dome but guides or programs the heavenly bodies as well. It is in all probability at a slight slant(like the Tower of Pisa) so that the ecliptic can intersect the Earth plane and give us our rising sign in astrology. 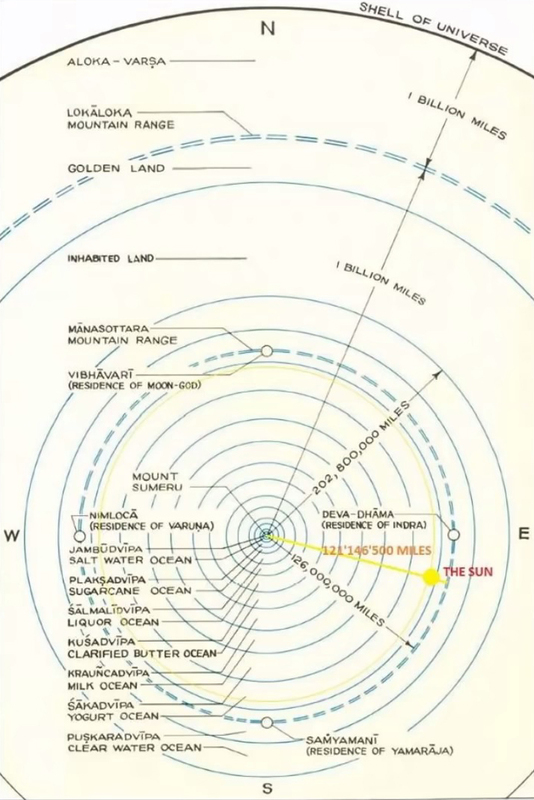 The Sun and its satelites(Mercury and Venus), the Moon, and the "outer" planets circle Meru each at varying speeds and distances. The fixed stars rotate once every 24 hours around the pole star(Polaris) which is just above Meru.. Contrary to modern astronomy, the heavenly bodies are very small and very close to us. The Sun may be only 32 miles in diameter and as close as the clouds themselves(its height and distance varies throughout the year to produce our seasons). In the Vedic diagram it is placed at 100,000 yojanas or 800,000 miles up from the Earth plane. This is better than the 93,000,000 miles of astronomy but is still way too high for our flat Earth model as we currently understand it. The Sun may in fact be only tens of miles up which is closer than the vedic distance by a factor of at least 10,000. Maybe we should divide all the other figures by 10,000 as well? 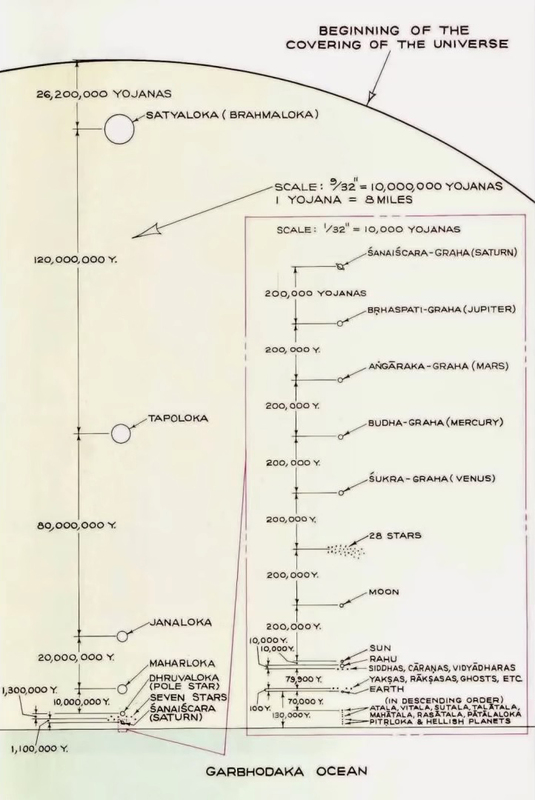 In the above diagram, Rahu is at 90,000 yojanas(720,000 miles) above the Earth plane, the Sun is at 100,000 yojanas(800,000 miles), and the Moon is at 300,000 yojanas(2,400,000 miles). These figures appear to be highly bloated. If we divide them by 10,000 we get 72 miles for Rahu, 80 miles for the Sun, and 240 miles for the Moon. Yes, the Moon is higher than the Sun in the Vedic scheme, which is odd since it moves over 12 times faster than the Sun(through the zodiac). The Karman line or first dome which divides our 1st atmospheric heaven from the 2nd planetary heaven is said to be situated at at 62 miles above Earth's surface. This puts all of these three heavenly bodies up above it in the second heaven where they should be. Meru reaches a height of 67.2 miles(when divided by 10,000) or just above the Karman line, bridging the 1st and 2nd heavens, and is 25.6 miles in diameter at the top. Meru also goes 12.8 miles below the surface of the Earth bridging our plane with the first of the hell planes. The bottom of cone-shaped Meru's base is also 12.8 miles in diameter. Continuing our climb, the 28 stars(Naksatras) are at 400 miles, Venus at 560 miles, Mercury(odd that it is AFTER Venus) at 720 miles, Mars at 880 miles, Jupiter at 1040 miles, and Saturn at 1200 miles. The 7 stars(Pleaides) are at 2080 miles, Dhruvaloka or Polaris is at 3120 miles, Maharloka is at 11,120 miles, Janaloka is at 27,120 miles, Tapoloka is at 91,120 miles, Satyaloka is at 187,120 miles, and the edge covering of our universe is at 208,080 miles up. Each of the additional 7 coverings of our universe are successively 10 times larger than the previous one, going into the trillions of miles. The yogi who wants to liberate himself from this material egg/universe must pierce or overcome the temptations offered by each of these coverings or layers. There are 104 miles(when divided by 10,000) between our flat plane and the Garbhodaka ocean of Bhumandala. Beginning 56 miles down is the first of the underworld regions or planes called Atala, followed by Vitala, Sutala, Talatala, Mahatala, Rasatala, and Patala. These are the 7 demon worlds with their great cities and materialistic lifestyles. The first two or three have some human as well reptilian characteristcs, but the mid to bottom ones are very serpent or snake-like. Between the the 7 underworlds and Garbhodaka ocean are the 28 hells where both humans and demons are brought to be punished for their sins, and below that is the vast Garbhodaka ocean, about half the size of Bhumandala, and in it resides the humongous Ananta snake/serpent/dragon who inhabits it. This is the serpent that both supports and destroy all of the physical Bhumandala creation with the permission of Krishna. An interesting description of all these worlds is found in the pdf book VEDIC COSMOLOGY by Airavata Dasa, available for free download online. It describes ALL aspects of the creation, from other universes to all components of our own universe, and does so in a very detailed and complete manner.